The reason behind the worshipping of Durga, Lakshmi and Saraswati lies rooted in the philosophy that the attributeless absolute can only be known through the world of attributes—the journey is from the known to the unknown. Hence it is said that Shiva, who symbolises pure consciousness, can only be known through Shakti, who represents divine energy. That is why people worship Shakti, also known as Devi, in Her various manifestations. The different stages of spiritual progress are reflected in the sequence of celebrations during Navaratri. During the first three days, Durga is worshipped. She personifies that aspect of shakti which destroys our negative tendencies. The process of trying to control our senses is akin to a war for the mind which resists all attempts at control. So the stories in the Puranas symbolically depict Devi in the form of Durga as waging war and destroying the asuras. However, getting temporary relief from the clutches of vasanas does not guarantee permanent liberation from them. The seeds of the vasanas will remain within in latent form. Therefore, we should supplant them with positive qualities. The Bhagavad Gita refers to these qualities as daivi-sampat, literally “Divine wealth”. Correspondingly, we worship Lakshmi during the next three days. Lakshmi is not just the giver of gross wealth or prosperity; She is the Mother who gives according to the needs of Her children. Only one endowed with daivi-sampat is fit to receive the knowledge of the Supreme. Accordingly, the last three days of Navaratri are dedicated to worshipping Saraswati, the embodiment of Knowledge. She is depicted as wearing a pure-white sari, which symbolises the illumination of the Supreme Truth. The tenth day is Vijaya Dashami, or the festival of victory, symbolising the moment when Truth dawns within. 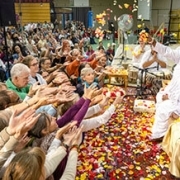 Thus, the significance of each stage of worship has clear parallels in the different stages of sadhana (spiritual practices): first, negative tendencies need to be controlled; second, virtues need to be ingrained; third, after gaining the necessary mental purity, spiritual knowledge needs to be acquired. Only then will the sadhak (spiritual aspirant) attain spiritual illumination. It is significant that Vijaya Dashami is considered auspicious for mantra initiation; advanced spiritual aspirants are also initiated into Sannyasa (vow of renunciation) on this day. 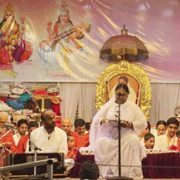 However, Navaratri is not only significant for spiritual aspirants; it has a message for those who lead a worldly life as well. They should invoke Durga’s help to surmount obstacles, pray to Lakshmi to bestow peace and prosperity, and contemplate upon Saraswati in order to gain knowledge. These three ingredients are just as necessary for a full and complete worldly life. In reality, when we pray like this, we are but invoking the Shakti that is within ourselves. Durga, Lakshmi and Saraswati are not different entities, but different facets of the singular Divinity. Some of the spiritual practices associated with Navaratri include fruit and milk fasts, japa (mantra chanting), chanting of hymns dedicated to Devi in Her different forms, prayer, meditation and recitation of sacred texts including the Devi Mahatmya, Sri Lalita Sahasranama and the Durga Saptashati. Children traditionally place their study books and writing implements on the altar. On this day, no work or study is done, that one might spend the day in contemplation of the Divine. 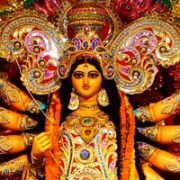 The tenth day is called Vijaya Dashami. Devotees perform a Saraswati Puja (Vidyarambham)to invoke the blessings of Saraswati. 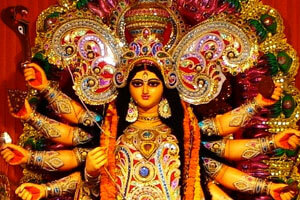 Some devotees also perform pujas dedicated to Durga to mark Her victory over the demon, Mahishasura. 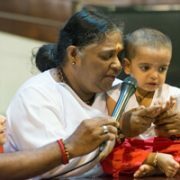 On Vijaya Dashami, Amma initiates babies/children into the world of alphabets. The ceremony involves tracing each letter of the alphabet of a mantra (Hari Sree Ganapataye Namah) in a plate of rice or even in sand on the ground. Traditionally, the writing was alternately done on the tongue with a gold dipped in honey. Its a good day to start first lessons on scriptures, music and instruments like tabla, harmonium, veena, violin etc. At another level, Navaratri also highlights the principles elucidated by the Ramayana. This is hinted at in the other name by which Vijayadashami is known in India, Dussehra.